I recently went to meet up with Liz from Garstang to get her story of having a premature baby. 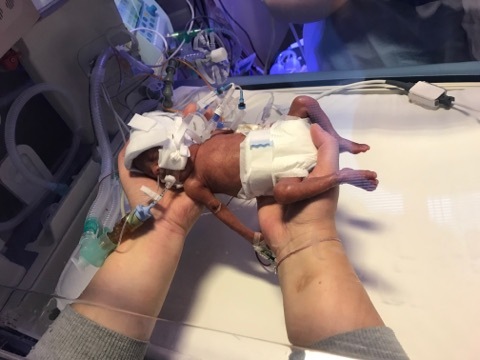 And I don’t just mean premature by a few weeks…… Any baby born before 28 weeks gestation is classed as extremely preterm, and you can find out more about the statistics on how common that is and survival rates for different gestation periods here. 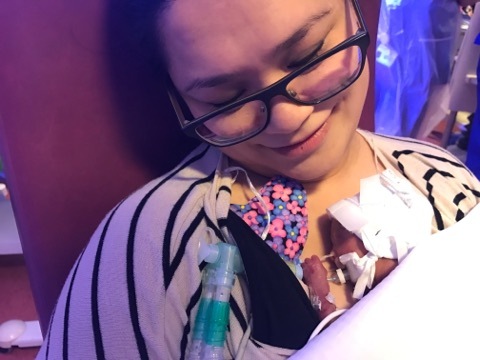 Liz’s story – My premature baby was born at 23 weeks and 4 days! Everything was fine during my pregnancy. The 20 week scan was ok, all looked normal and we found out we were having a girl. A few weeks later, I started to feel a lot of pressure in my lower abdomen. I went to see my midwife for a checkup, and was told it was all part of my hormones and my body stretching but then I noticed my bump looked like it had dropped. My husband said it was probably my imagination, with it being my first baby I thought it was just me being over anxious and so as I’d been checked over recently I decided to put it down to my hormones and tried to relax. Then at 23 weeks and 4 days, I woke up and I didn’t feel right, I felt an immense pressure felt like I needed to push. I went to the loo and had some discharge and then some blood. We rushed to hospital to get checked. A trainee midwife stayed with us whilst we waited for the consultant to come and see me. I kept needing to go to the loo and it felt like I was having contractions, but surely I couldn’t be. We’d kept the pregnancy relatively quiet and most people didn’t even know yet that we were expecting. We timed it and these feelings that I thought could be contractions were taking place every 6 minutes. We told the midwife and 20 minutes later, the consultant came to do an observation and examination but then told us that they needed to get the ultrasound machine. I will never forget the consultant’s look on her face when she told me “I’m so sorry but you’re 6cm dilated.” I thought there would be drugs they could give me to stop the labour or stitch me up, but they told me that my baby would be coming anytime – they couldn’t tell me when and they told me I had to lie extremely still and I was not to cough or sneeze. 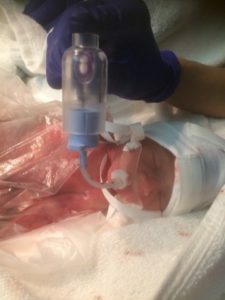 We had decisions to make – RLI doesn’t officially take deliveries under 27 weeks and if we stayed there they wouldn’t have the facilities to do the sort of interventions that can be done in larger units, meaning that the survival rate at RLI for premature babies born at this gestation is below 10%. We asked to be referred to Preston, and meanwhile they gave me medication to try to slow things down and protect the baby’s brain. If the baby was born here and not breathing they wouldn’t be able to do much for her. We decided we would go to Preston whether it was officially agreed or not. Thankfully, Preston had capacity to take us and an ambulance transported me there, but as we were approaching I strongly felt I needed to push. The paramedics said I had to hold on until I was on the ward so I did my best to resist the need to push. I made it into the delivery suite and felt really out of it by now, but my husband wasn’t with me as he’d followed in the car. Panic set in and I began to realise what was actually happening and at that point I just looked at the midwife who had come with me from RLI and said “I can’t do this, I don’t want my baby to die she’s too early” I had to go along with what my body was telling me and push as soon as I was in a safe place surrounded by the experts and the life-saving equipment they needed. When Penelope was born, she wasn’t breathing, but within 2 minutes they got a tube down her throat and it worked. (We’d had to make the decision before she came out what we would do – would we want medical intervention to help her or leave her be. We’d made the decision for the doctors to intervene but if the intervention and ventilation didn’t work and Penelope wasn’t breathing, we’d already made the tough decision to not put her tiny body through more stress as survival rates were so low). Thankfully she started breathing, her body went a healthy pink, and so the staff were happy that she had a chance now and to continue helping her and doing what interventions were necessary. We were able to see her for a couple of minutes before she was whisked off to the Neonatal Intensive Care Unit. We didn’t see Penelope for 6 hours after she was born. I’ve got a 48 hour blank in my memory where I must just have gone onto autopilot. We were at Preston hospital for 5 weeks. For the first few days Penelope was pumped full of medication to help her along, but when those were gradually withdrawn, she started to deteriorate and had a collapsed lung. She was on 90% oxygen at one point and had 2 collapsed lungs and we had to decide whether to give her steroids. If we’d decided not to, we were told she might not survive the night, but if we did, there was a risk of brain damage. We felt we had to do something. At that point we had no idea whether she’d ever live a normal life and just wanted to give her every fighting chance. At about a month old, Penelope suddenly went stiff and pale, with her heart rate through the roof. They diagnosed a tiny perforation of the bowel which they thought was NEC (necrotizing enterocolitis) but it turned out not to be, however Preston didn’t have the facilities to perform this operation and so sent us to St Mary’s in Manchester by ambulance. In surgery, they cut out part of her intestine and she had a something called a stoma. 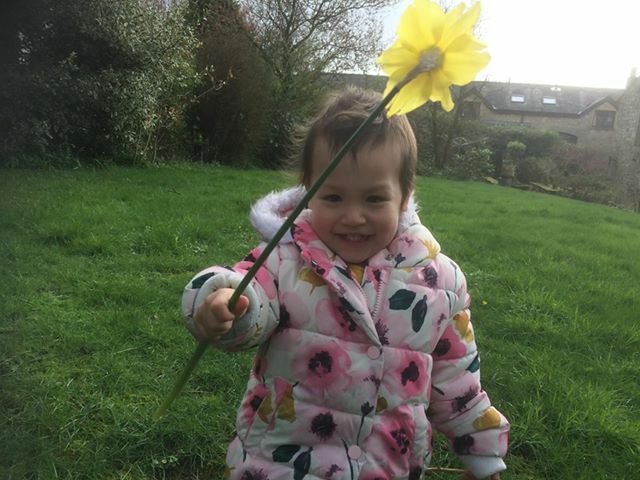 She had to have a little colostomy bag for 7 or 8 weeks until she was big enough so that she could have another operation to reconnect the intestine and fix it. Penelope also had ROP, which is where more blood vessels grow in their eyes due to the amount of oxygen they’re on. Penelope needed laser surgery to fix this, and that consisted of over 1000 pricks to burn the vessels. Luckily that worked and at the moment her eyesight seems normal. We go for regular checks at Manchester Royal Eye Hospital. Overall we were in hospital for about 4 months and came home about a week after her due date and she hasn’t needed any operations since. This all started several months before my maternity leave was due to start. I rang my manager to let them know what was going on, and I only had 1 day sick leave and then my maternity leave started the day after she was born. I didn’t want to see anybody except direct family. It was just too much to deal with. I texted 2 people who I was close friends with, but we didn’t tell anyone else we’d had a baby. I just wanted to focus on my baby every day and what was going on and didn’t have the headspace for potential questions or sympathy. We got some cards from people and that was nice, but we didn’t know whether she would make it and wanted to keep it private. My first kangaroo hold with her. Penelope is our first baby, so I could be with her 24hours. It would have been so difficult if I’d had other children at home. We could be in the room all day, and I was given a room in the off-site accommodation for parents of children in hospital in Preston. Then in Manchester, we were in the Ronald Macdonald accommodation. I chose to try and express and I was lucky that I was able to do so. Then from about 4 months I started to breastfeed. I was really lucky when expressing in that my supply was good and my milk came in after a couple of days, and I’d had a lot of help from the nurses. (Although it was very stressful to begin with when my body wasn’t ready to produce milk). When it comes to what I might have liked from people – some premature milestone cards would have been amazing. We spent weeks, or even months not knowing whether she’d survive, or what her quality of life would be if she did. Premature baby clothes would have been good too. Snacks and ready made meals from family was a godsend as some days we only had drinks and snacks. When you’re expressing/breastfeeding it’s so important to try and eat well. I knew. It needs to be spoken about. You’ve got to make decisions from a place of shock and denial. 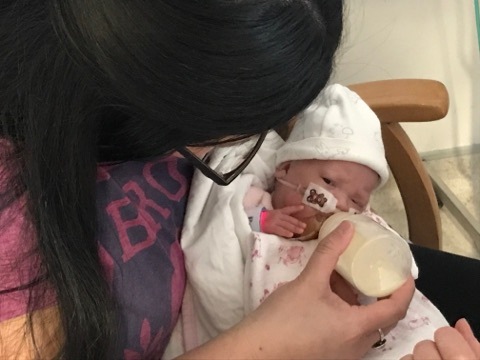 There’s no predictability about any of it or about long-term prognosis – the doctors say they’ve never seen a baby like her Penelope – unbelievably, she’s not going to have any serious long-term health issues and that’s amazing. At both Preston and St Marys Children Hospital, the nurses were amazing, and parents of other babies were too. At Manchester there was a counsellor on call at all time, but I don’t think there is in Preston or Lancaster. We’ve got a network of friends now who all had preemies at the same time. We had an amazing health visitor who rang me almost straight away after the birth, then rang whichever hospital we were in every single week so knew what was going on with us and I didn’t have to go through it all when we first met. Penelope came off oxygen about a week before she came home. I took full 12 months maternity leave plus 2 months leave and then put her in nursery and she’s been fine. Penelope has chronic lung disease – but this will improve as she gets older. It often develops into asthma. Pretty much all premature babies have it. When she gets a cold, it means she’s more prone to needing intervention and assistance in hospital and she has had a few stays so we’re good at spotting the tells when she’s struggling to breathe. We’re on first name terms with the staff on the children’s ward at RLI. We can’t praise them enough for the care we have received from them. We announced the birth when we came home from hospital and nobody really knew how to take it. Many hadn’t known I was even pregnant, or the few that did were waiting for a birth announcement and instead had an announcement that we had a baby who was 4 months old. We were worried about germs and we probably cocooned ourselves for about 1.5 months before we started looking for groups. When I started baby sensory, I was really surprised to find that in our group, there were 5 or 6 premature babies. I think it was just a coincidence, but we all got a lot of support from each other and it was good to not have to constantly explain our baby’s small size. As a premature mum you are constantly worried about germs, coughs and colds. Some people don’t understand the impact this can have on a premature baby and even now I think people still don’t understand why I am so careful about coming into contact with people who are ill. For Penelope a cold could turn into a week on oxygen and can mean the difference of being admitted into hospitaI. I have been known to cancel activities or family events if I know that someone has been poorly. If someone who sees us has a cough or a cold, that could result in a hospital admission for us. Some mums feel like they’ve missed out on pregnancy when they have a premature baby. I don’t feel like that. I feel blessed that I was able to watch her grow – I’m just glad that she’s with us and was able to come home. We saw milestones that you wouldn’t if she was in my belly, like when she opened her eyes for the very first time. Penelope is now a happy, healthy 2 year-old and is hitting all 2 year old milestones (without using corrected age). Our happy, healthy 2 year old. Barrow can’t care for babies under 32 weeks and Lancaster shouldn’t care for babies under 27 weeks. At RLI they can ventilate and provide any other means of respiratory support needed. That doesn’t mean that babies below that gestation don’t deliver at either site. Staff then stabilise them if possible and send them out to a tertiary unit. Ie Preston or Burnley. The reason for this is that extremely premature babies have much better outcomes being looked after in acutely specialist areas, with neonatologists, and not just pediatricians. At Lancaster and Barrow we only have paediatricians. It is significantly better for the baby if they can deliver the baby in a tertiary centre, as not only will they be being cared for by experts that look after 23 and 24 week gestation babies all the time, but they also have more specialist equipment than Lancaster does, that extreme prems could need. 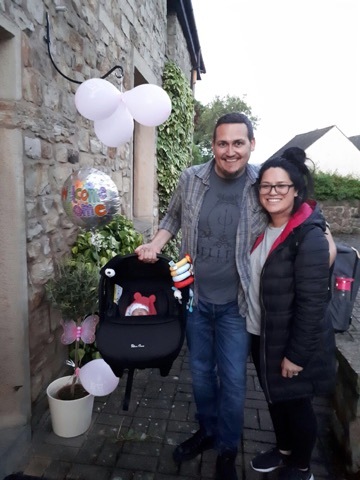 Delivering baby in Preston also means they don’t need to be transferred at a few hours old, (and the transfer after birth would increase risk of brain bleeds and a whole host of other things). Many parents who have extreme preterms or any premature baby suffer from PTSD. Rates of PND tend to be higher than parents who had babies at term. When it comes to looking out for parents after the birth, some of the bigger neonatal units now have their own psychologists which is amazing. Most neonatal units are trying to improve on their provision to support parents’ mental health.